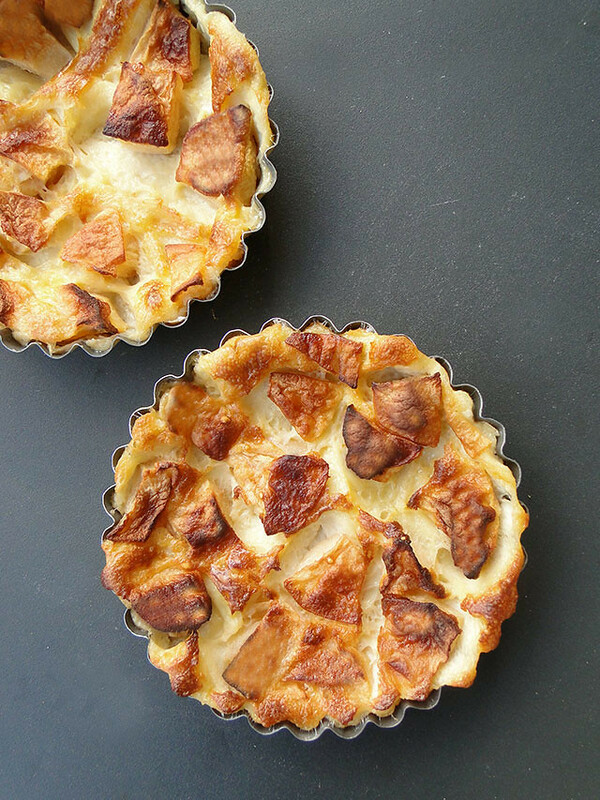 Apple flognarde is nothing more than a clafoutis. 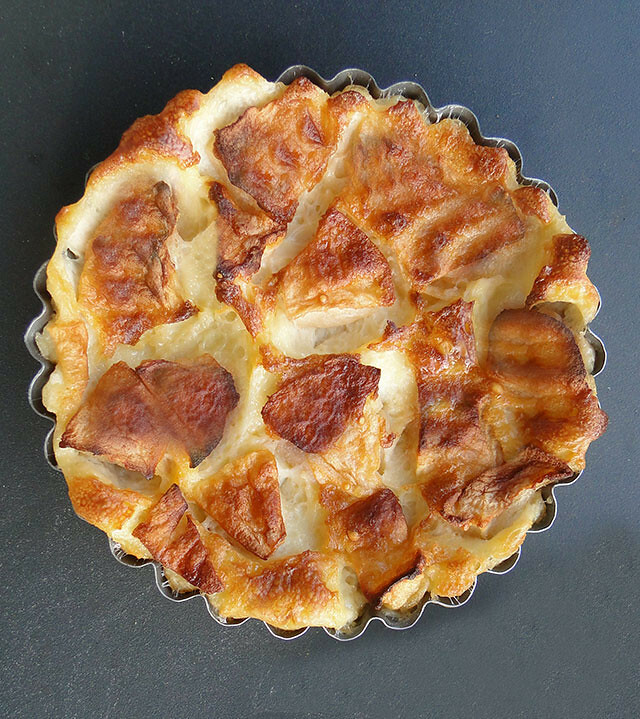 In some regions in France, the traditional french dessert – clafoutis is referred to as flognarde. The flognarde is usually made with apples or pears. This dessert is so simple - just a sweet batter poured over a layer of apple chunks and baked in the oven. You can eat this dish as a hot pudding, or a cold dessert. Peel and core the apples then cut into chunks. Grease the tart tins with butter and sprinkle some flour. Place them on a baking sheet. Divide the apple chunks evenly between the tartlet tins. Gently heat the milk until warm. In a mixing bowl, whisk the eggs until blended and foamy. Add the sugar, flour, oil and whisk until smooth. Gradually whisk in the warm milk. Using a ladle, carefully pour the liquid batter over the apple chunks in the tins, filling up to the rim. Bake for 30 – 45 minutes until the flognarde is puffed and golden. Faites préchauffer le four à 200ºC. Pelez et coupez les pommes en morceaux. Beurrez et farinez les moules et déposez les pommes. Faites chauffer le lait. Dans un saladier, cassez les oeufs. Battez-les au fouet. Ajoutez le sucre, la farine, l’huile, puis le lait qu’on a légèrement tiédi. À l'aide d'une louche, versez la préparation dans les tartelettes à hauteur. Faites cuire de 30 à 45 min, afin que la flognarde gonfle et dore. This looks fab - and so easy to make, too! I must try it sometime. A perfect autumn afternoon tea treat! Mmmhhh, divine! I love apple desserts/treats. Simple and simply beautiful. This look scrumptious! All your recepies looks gorgeous. Do you have a restaurant or a backerry where we can buy your products? I had seen this flognarde in some websites and cookbooks; yours look particularly appetizing. I have all of these ingredients on hand all the time, and also have those little tart dishes! I love recipes that use things I have at home. This is such a beatiful dish and a great use for apples! I have a ton of apples on hand that I'm trying to use up, and this dessert is calling my name. This also looks a little like what my family calls a German Pancake or Dutch Baby. YUM! more delicious scrumptious ways to spend those apples! I've never heard this, book it looks very appetizing and seems simple. So this, I assume, is pretty custardy? question....Do your tart pans have the lift out bottoms? If so, how do you keep the batter from leaking through the bottom? @ dianneconner: My pan tarts do not have the lift out bottoms. We eat the clafoutis directly from the tart pan. Oooh, I think I'll be trying this this weekend! I love it when I don't need super special ingredients! Looks DELISH! I made these last month and we LOVED our flognardes! (much like clafoutis). one of my favorite dessert! Made this last nite -- loved it! 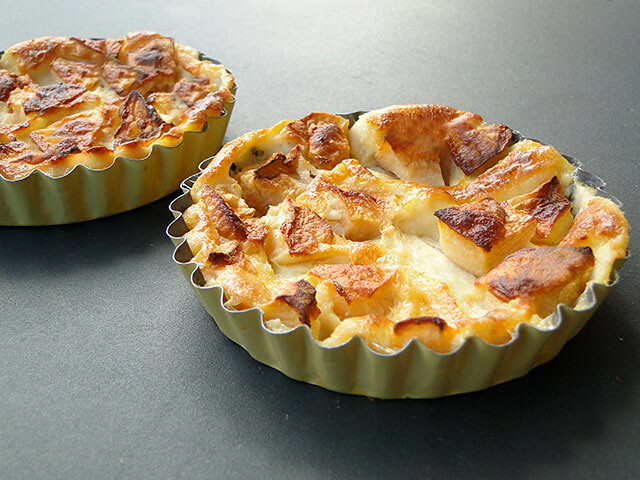 I love the pictures and I like your idea of baking it in individual tart pans. Looks so pretty! The golden top looks gorgeous! I have to try this with some of our local apples. Wow! you have one amazing blog. My hubby lovesss Lebanese food :) hope to pick on some of your recipe. Following you!! elle est splendide ! j'adore ça ! So beautiful for fall...wonderful tart! Hello! I loved the idea of this recipe, so I decided to try it out at home. My turned out really dense and eggy, and didn't look anything like your beautiful, flaky flognarde. Any tips? Did you follow the recipe? What changes did u do? I have tried it many times and it always come out perfect!! Mine was very eggy and dense. Maybe it was just me... But I followed the recipe exactly. Any ideas?